'Relentless Rain' Pummels Southern California, But Worst May Be Over : The Two-Way While mudslides remain a serious danger, the rain should end tonight. And forecasters expect sunny skies on Thursday in Los Angeles. San Diego, Dec. 21: Flood waters rose in the San Diego River. 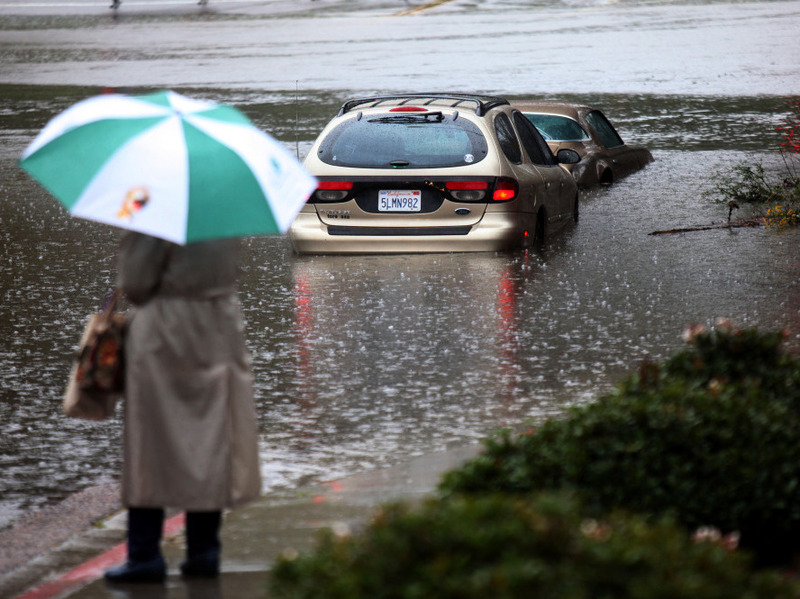 Korva began our day with word that a "monster storm" continued to pound California. "After days of relentless rain, Southern California is awaiting the most intense storm system yet, with evacuations ordered, roads covered by water and mud, and residents anxiously eyeing already saturated mountainsides denuded by wildfires." But NPR's Philip Bruce reports that today's storm "split as it was moving on-shore, sparing Los Angeles County a direct hit." Still, "heavy rain continues to fall over a wide region, causing widespread flooding and isolated mudslides. Orange County, south of Los Angeles, took a harder hit than the city and has ordered neighborhood evacuations in hillside neighborhoods threatened by mud and in low areas that are flood prone." The Associated Press adds that the storm "appears to be easing," though "authorities say the threat of mudslides will continue for weeks in areas denuded by wildfires." The National Weather Service says the heavy rain should turn to showers later today. The good news for tomorrow in Los Angeles County: "Mostly sunny, with a high near 59." 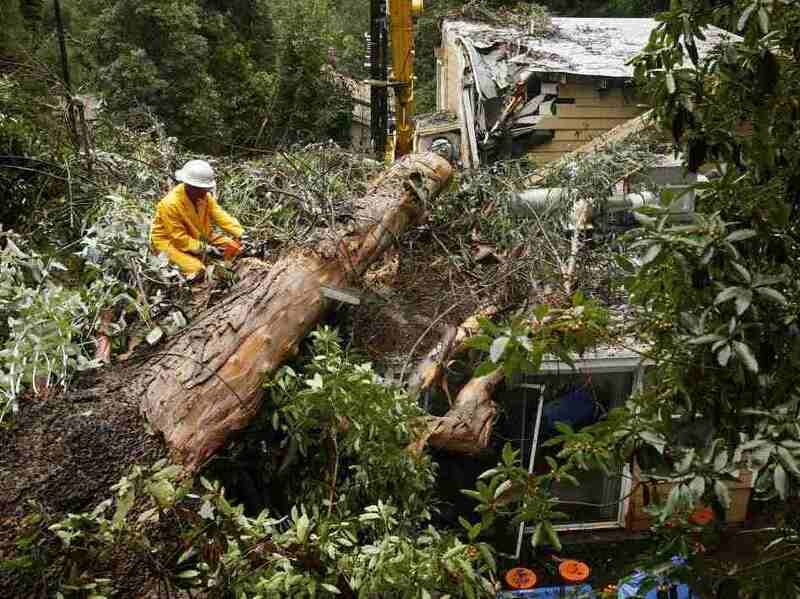 To the south, in San Diego, the Union-Tribune writes that "the subtropical system dumped more than two inches of rain on parts of the county before dawn and produced winds that gusted to 61 mph at Point Loma. The rain has eased, but forecasters say thunderstorms, hail and, possibly, funnel clouds are possible late this morning or early this afternoon." Korva noted that the "Pineapple Express" is being cited (or blamed) for pushing all that rain over California. The National Weather Service's Seattle office has an audio slide show that explains how that weather system works. As it says, the Pineapple Express is "a humorous yet memorable phrase that is used to describe weather systems that have their moisture source in the tropics. For us, the source is close to Hawaii, which has a lot of pineapples!" Los Angeles, Dec. 21: Cleaning up after a tree fell on a home.